It is another beautiful day in Denver, Colorado! I wish to express my sincere appreciation to the entire staff of the Clinical Nutrition Center, specifically Susan Ellis, R.D. and Heather Thomas, PA-C. They have been great coaches and so helpful in assisting me in gaining better health. 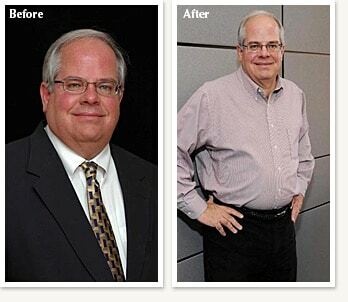 I came to the Clinical Nutrition Center on a referral from a good friend that lost 160 lbs. He indicated to me that I definitely needed help and should seek assistance; told me I could not do it on my own. Fortunately, I listened and my present results validate my success. When I came through the doors of the Clinical Nutrition Center in July 2007, I looked like a cantaloupe with back hair! I am not kidding, I was fat, bald, continually out of breath and my face looked 10 shades of red continually. I am still bald! I snored like a diesel truck and felt and smelled like one! My idea of dieting was to use a small cocktail fork to eat a 24 oz. porterhouse steak. Literally, when I thought of food, my laser mind focused on “slabs” of red meat and “mounds” of fried food with absolutely nothing green in sight. The only “green” I wanted to see was when I was playing golf, riding in a cart.. .not on my plate. Susan sat down with me and showed me her trusty “deck of cards” and indicated that the deck represented the proper size portion that I should quickly become accustomed to. I then came to the realization as to why I find card playing so distasteful. I recently wrote an article for the Colorado Real Estate Journal, which is attached that goes into more depth regarding the mental side of the equation. Finally, I want to share with you a “before” and “after” absolutely true story. One year ago, I took my two sons skiing at Ski Cooper, the very best family ski resort in Colorado! I parked no more than 150 yards from the ski lodge and proceeded to pack my skies up the small incline to the lodge. I was completely winded, sweating like a pig, and truly felt that I was going to have a heart attack. I was so concerned, that I did not ski that day. I sat in the lodge reading a book and eating whatever I found. I was a pathetic site to behold. I just took my two sons back to Ski Cooper on December 24th and 25th and parked close to the very same spot and proceeded to pack my skies up the dreaded “small” incline to the lodge. I did not even break a wind! I could not believe how good I felt. I skied both days!! Not once did I feel like I was going to have a heart attack. My oldest son commented that my “losing” 50 lbs of fat made an unbelievable difference in my skiing. That is an understatement! I attribute this success to great coaching. I will never forget the one Wednesday morning a few months back when I met with Susan and my weight had not changed for two weeks. She asked me a very pointed question: “Are you exercising?” I told Susan that that word was not in my vocabulary. She replied: “Steve, you cannot get the results you want by just dieting, you must also exercise on a regular basis” And then to really drive her point home said: “You are wasting your money and my time if you are not going to exercise” Ouch. I now exercise 30 minutes a day. I dusted off the dreaded treadmill and stationary bike and walk and ride every morning! Exercise is really kind of fun….especially when I break a sweat now from a good morning of exercise and not just getting out of bed. I love being in better health! I have dropped 47 lbs to date, going to 70 1bs by the end of the 1st quarter 2008. I have dropped 4 suit sizes, 2 inches around my neck, necessitating a new wardrobe. My wife now calls me her “trophy husband“. She also donated every suit, pant and shirt to Good Will so that I literally have nothing to grow back into. Now that is real “love“! As James Taylor sings: “How Sweet It Is to Be… in good health, a trophy husband, not diabetic…with the hopes of living a long and happy life with my wonderful wife – to vigorously enjoy our 5 children and 4 grandchildren…with hopefully many more on the way!